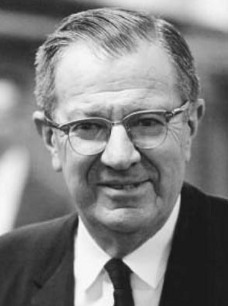 Frederick Terman studied under Vannevar Bush at MIT, and conducted important research into electronics research and anti-radar technology, including World War II work that helped Allied aircraft elude anti-aircraft fire. He virtually founded Stanford's modern electrical engineering program, largely underwritten in early years with royalties from his own numerous patents, which included several improvements to vacuum tubes. He began teaching part-time at Stanford while recuperating from tuberculosis, spending two hours each day in class and the rest of his time in bed. Years later he mentored two of his former students -- William Hewlett and David Packard -- as they went into business marketing an audio oscillator. As Stanford set aside some unused land on the campus for use as an industrial park, Terman proposed that hi-tech firms be courted as prospective tenants, to help Stanford graduates find industry jobs and to increase the university's association with technology leadership. He urged William Shockley to bring Shockley Transistor Laboratory to Palo Alto; other early occupants included General Electric, Hewlett-Packard, Kodak, and (Broken link for lockheed). Stanford Research Park is still among the world's largest and most successful, and Terman is considered a founding father of Silicon Valley.